I HAVE THE SETS IN BLUE & GOLD.THEY ARE PEEL AND STICK CENTERS. 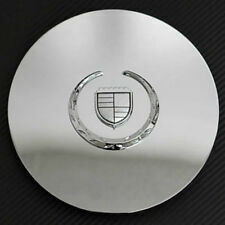 These allow you to use the Escalade wheels on other GM vehicles without the Cadillac emblem. Centers are a perfect match to the wheels. Factory Rims - Cadillac Escalade). - New 22' 7 Spoke Rims (Qty. 4) with Valve Stems (Original. PART # 23432315. QUANTITY OF 3. GRILLE EMBLEMS. MOUNTING BRACKET FOR. NEW IN BOX. 04-07 Cadillac CTS-V CTS V Wheel Center Hub Caps Aa6418 [[Stock #]] M7565-WRH GM ALL USED PARTS WILL HAVE NORMAL WEAR AND TEAR. 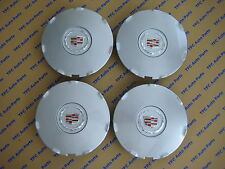 Here is a used center cap for the 2003-2004 Cadillac CTS with 16" 7 spoke silver painted aluminum wheels. It is in decent condition with typical wear and tear. It is priced far below the dealer's price for a new center cap. FIT : 1995-1999 Cadillac Deville, Seville, Eldorado. Fit is only a reference guide. Always check with your dealer for exact fit. Always be sure your part number matches our part number. CONDITIO N : Used. 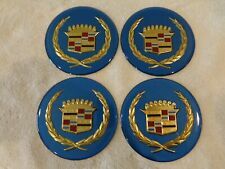 Here is a decent condition used center cap for the following Cadillac Vehicles As you can see it has typical wear & tear. All other photo's are file images. (1) Single Center Cap. Our policies are as follows. But at the least - IF YOU SEE YOUR WHEEL STYLE BELOW THEN THESE WILL FIT! Do not change the number from "1" in the box below unless you desire more than one set of four. Looking for factory rims?. It will fit your 2007-2009 Escalades with the 7 spoke 22" wheels. Good Luck! We strive to earn 100% perfect "FIVE-STAR" scores from you. THERE ARE FORD CHEVROLET JEEP CADILLAC NISSAN AND MORE. Fits most2005-13 GMC, Chevy, Cadillac wheels that accept 3.25”centers including Suburban, Tahoe, Avalanche, Silverado, Sierra, Yukon, Denali and Escalade. All of the tabs and retention rings are intact. They are used with typical wear & tear / scratches / nicks etc. Fits 1996-1999 Cadillac Deville with 14 Slot Brushed Aluminum Finish Rim Only. Machined Finish. 4525CC SET. (1) Set of 4. Why You Should Buy From Us. Everybody makes mistakes. But we won't argue with you. You won't need to wear gloves to install your hubcap, and your hands will not get dirty! This is a used (Recycled!). hubcap from a salvage yard. THERE IS FORD TOYOTA DODGE MITSUBISHI CADILLAC CHEVROLET. 2015-2019 Cadillac Escalade Premium / Escalade ESV Premium 22" 7 Spoke Factory Rims (See Example Photo). They are used with typical wear & tear / visible scratches etc. The part number on the back is 23432315.